The Volkswagen Karmann Ghia turned 60 this week, that is 60 years from the day the Karmann Ghia prototype was first shown at the Paris Motor Show. The Karmann Ghia was an iconic car for VW, and still has fans who come out of the woodwork to ogle and reminisce about old times. The birth of the Ghia came from two men: Wilhelm Karmann, the head of the company which built the Volkswagen Beetle Cabriolet since 1949, and Luigi Segre of Carrozzeria Ghia, an automobile design shop in Turin. Karmann had the idea to construct a convertible sports car on the Beetle chassis, and approached Segre for help. They produced the first prototype in 1953 without even consulting Volkswagen. While their vision was for a convertible, the first prototype produced had a hard top (making it a coupe). In October 1953, the car was taken to a small garage in Paris and shown by Ghia to Karmann, who had traveled to the city for the Paris Motor Show. Then in November 1953, Karmann showed the car to Volkswagen chief Heinrich Nordhoff, thanks to his close relationship with Volkswagen. The prototype won over Nordhoff, and after the costing was worked out, a decision was soon made to go into full production. 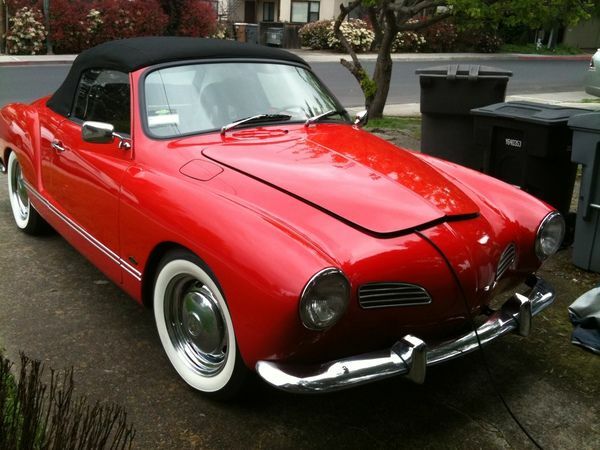 The Karmann Ghia is basically a Volkswagen Beetle, but with a sports car top. It was internally known as the type 14, was made between 1955 and 1974, and over its lifetime 450,000 were built. The Convertible Karmann Ghia went into production in 1957, and of the 450,000 Ghia's built 362,601 were coupes (hard tops) and 80,881 were cabriolets (convertibles). The one-off coupe prototype is part of the Volkswagen Osnabrück private collection. The Karmann Ghia is a fine example of old school design and styling, and in well restored condition has a number of nice design flourishes. For example, in the center of the steering wheel is an image of a castle behind a river with a wolf, that is the Wolfsburg coat of arms, the city where the Karmann Ghia was manufactured. As the driver of a nicely restored Karmann Ghia, I can attest to the Ghia fan base for given the number of people who literally come out of the woodwork to ogle my car. These people are astounded to learn it has been converted to electric drive. Look carefully at the picture above, and notice the extension cord coming out the front. By the way, Tesla may have invented the word "frunk" but they did not invent the "Front Trunk". The adolation the Karmann Ghia fan base has for my car begs a question - why doesn't Volkswagen resurrect the Ghia like they did the Beetle? Or more importantly, given what they did to the Beetle during its resurrection, do we want a similarly resurrected Ghia?